Home » Anime/Manga » Robotech Titan Comics Trailer! Written by: JediJondee46 on May 22, 2017. The trailer for the new Titan Comics series Robotech has dropped! It features the opening of the Robotech animated show that ran in 1985. The series featured young pilot, Rick Hunter, who joins the veritech pilots on the converted alien ship, the SDF-1, Super Dimensional Fortress One. Veritechs were fighter jets that could convert to robotic forms. The original name for the anime was Super Dimension Fortress Macross (1982) and this also made it’s way with the place where the ship berths with Macross Island. We also see Hunter’s friend and mentor in a way, Roy Fokker, veteran pilot of Skull Squadron. This appears to be the back story that was established in Robotech: The Graphic Novel (1986). It was published by Comico from a story by creator of the francise, Carl Macek, written by Mark Baron with art by Neil Vokes. 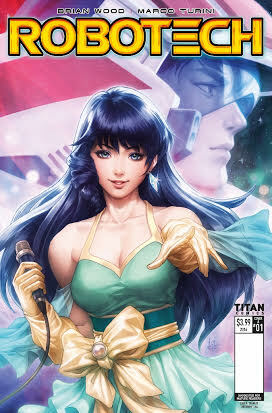 The graphic novel covered how Zor, a character from the second series, Robotech Masters, discovered Protoculture, the McGuffin of Robotech. He placed it in a fortress and was killed by the Invid, the alien race in the last series, Robotech: The New Generation. His last order was to send the fortress away from the Robotech Masters. So this story unifies all of the three story lines together. The comic book is written by Brian Wood who is incredible at writing his own creations with Northlanders and Rebels, but is also co-writing John Carter: The End for Dynamite Entertainment. The art is by Marco Turini who was the artist on Squadron Supreme for Marvel. The Robotech comic will space fold into comic book stores on July 26th.